It’s been 145 years since Don Cenobio Sauza started La Perseverancia Distillery and began making what would become world-renowned Sauza, Conmemorativo, Hornitos, and Tres Generaciones tequila. Situated in Tequila, a municipality of the state of Jalisco, Mexico, the distillery has grown in size and scope over the last century, and is now owned by Beam Suntory. A lot has changed since Sauza turned out his first batch of tequila in 1873, but what hasn’t changed is the manufacturer’s commitment to keeping its primary operations in Tequila. This small town is about 43 miles away from the nearest large city of Guadalajara, where about seven years ago the company decided to locate a new logistics hub. After working for three years with one third-party logistics (3PL) provider, the manufacturer put out a request for tender (RFT) in 2016. Through that process, it hoped to find a new partner that would enable automated logistics processes, make recommendations, and introduce the company to new ways of managing the modern-day export supply chain. After identifying some activities that it felt could be improved, Sauza Tequila’s logistics team decided to validate whether or not its current processes were optimal. It also compared the firm’s values and culture versus its current 3PL setup. Another key factor during the qualification process was a visit to one of DB Schenker’s contract logistics operation in Guadalajara, where the Sauza Tequila team got a firsthand look at a best-in-class 240,000-square-foot operation. This helped the manufacturer better envision what its own operation would look and feel like once mobilized. 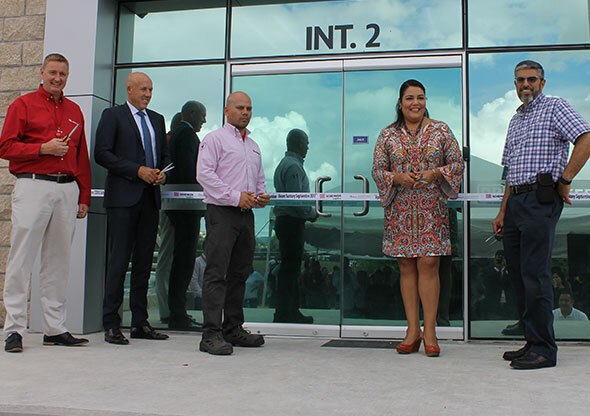 In September, DB Schenker opened its brand-new, 50,000-square-foot logistics facility for Sauza Tequila in Guadalajara. From this dedicated facility, Beam Suntory utilizes DB Schenker’s full scope of human resources, warehouse equipment, and contract logistics capabilities to manage the export of its finished goods. “This facility is entirely focused on Sauza Tequila’s end-to-end export requirements,” says Barba. Within the facility, the Consejo Regulador del Tequila (Tequila Regulatory Council) will have dedicated space where it will perform the validation of products for export. Sauza Tequila is also utilizing DB Schenker’s warehouse management system (WMS) to support and automate its day-to-day logistics operations and centralize the tracking of inventory levels and stock location.